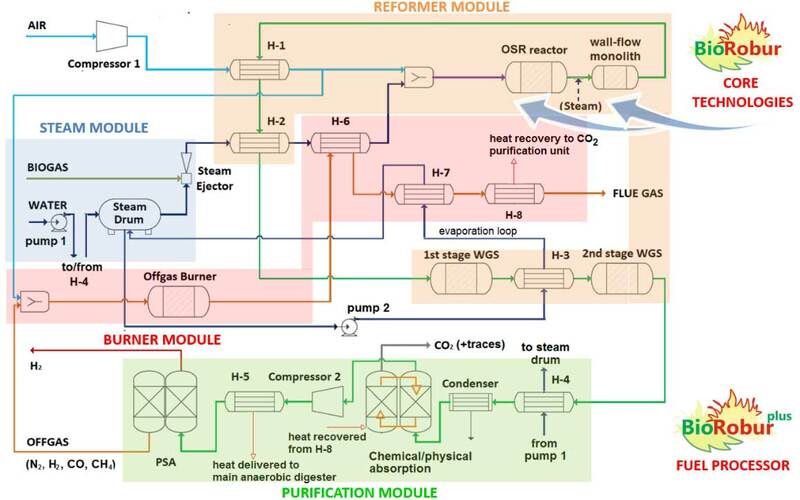 BioROBURplus builds upon the closing FCH JU BioROBUR project (direct biogas oxidative steam reformer) to develop an entire pre-commercial fuel processor delivering 50 Nm3/h (i.e. 107 kg/d) of 99.9% hydrogen from different biogas types (landfill gas, anaerobic digestion of organic wastes, anaerobic digestion of wastewater-treatment sludges) in a cost-effective manner. The complementary innovations already developed in BioROBUR (advanced modulating air-steam feed control system for coke growth control; catalytic trap hosting WGS functionality and allowing decomposition of incomplete reforming products; etc.) will allow to fully achieve the project objectives within the stringent budget and time constraints set by the call. Prof. Debora Fino, the coordinator of the former BioROBUR project, will manage, in an industrially-oriented perspective, the work of 11 partners with complementary expertise: 3 universities (POLITO, KIT, SUPSI), 3 research centres (IRCE, CPERI, DBI), 3 SMEs (ENGICER, HST, MET) and 2 large companies (ACEA, JM) from 7 different European Countries. A final test campaign is foreseen at TRL 6 to prove targets achievement, catching the unique opportunity offered by ACEA to exploit three different biogas types and heat integration with an anaerobic digester generating the biogas itself.